Already deep in the red, the Himachal Pradesh State Road Transport Corporation (HRTC) will be hit hard by the hike in the diesel prices and it may even collapse, unless the government reviews its transport policy to undo the impact of indiscriminate privatisation. The state unit of the CPM has decided to hold statewide protests on June 27 against the hike in diesel, kerosene and cooking gas, while the state BJP has charged the UPA government with passing on its own financial burden to the states by asking them to reduce taxes on petroleum products. Health and Ayurveda Minister Rajeev Bindal said here today that the hike in the prices of petroleum products soon after the completion of the Vidhan Sabha polls in a few states was a big conspiracy of the UPA government. The government will set up drug de-addiction centres in all 12 districts of the state and a special campaign will be launched to enforce the law against traders selling tobacco products within a radius of 100 yards of educational institutions. Social activist and president of the International Arya Samaj Sabha Swami Agnivesh today said transparency in the funds raised by political parties was a pre-requisite for eradicating corruption form the system. Jammu and Kashmir Chief Minister Omar Abdullah’s family members had a narrow escape today when their raft overturned in the Beas near Bhutti Colony while they were on a rafting adventure. Accusing the government of ignoring apple growers, Leader of the Opposition Vidya Stokes today said Chief Minister Prem Kumar Dhumal was not taking the steps required to make a foolproof case for imposing a ban on the import of apple from China under the provisions of the WTO accord. The state government will take up the issue of the Bhakra Beas Management Board (BBMB) police barrier near the Goalthai industrial area with the Chairman of the board. This was stated by the Industries and Labour Minister Kishan Kapoor while talking to The Tribune. Chief Justice of the Himachal Pradesh High Court Kurian Joseph today exhorted people, particularly the youth, to rise above their personal interests and serve the nation. SK Sharma, Vice-Chancellor, CSK Himachal Pradesh Agricultural University, has called upon extension specialists to ensure the speedy transfer of the latest farm technology to farmers’ fields. It is a complete switchover to Hindi at Himachal Pradesh University (HPU) where for the first time the agenda for a meeting of the Executive Council (EC) held here yesterday was prepared in the national language with strict directions being issued to all officials by Vice-Chancellor ADN Bajpai to use the language for all official use. The new session of the newly established Indian Institute of Hotel Management and Catering Technology (IIHMCT) will begin in its new building near here on July 18 this year. The 16-room Manali Circuit House in the heart of this tourist town where once the country’s first Prime Minister, the late Jawaharlal Nehru, used to spend his holidays along with his family, has been turned into a “personal fiefdom” by the office of the Assistant Commissioner, Kullu, which is allegedly running a “booking racket” in the name of ministers and VVIPs here. Dr Vivek Bindal of Solan has earned a rare distinction by being invited by the European Association of Endoscopic Surgeons to present a paper at its 19th annual congress at Torino, Italy, recently. The hike of Rs 3 per litre will put an additional burden of Rs 12 crore annually and with the bus fares already the highest in the country there is no scope for further increase. The fare for hill area is Rs 1.11 per seat per km as against 93 paise in Uttarakhand, which is the next highest in the country. The bus fares were last revised in March 2010 and this is the second hike in the prices of diesel since then. The overall increase to Rs 5 per litre will increase the annual operational costs by Rs 20 crore. The accumulated loss has crossed Rs 560 crore and with an income of Rs 24 per bus per km as against the expenditure of Rs 29 the situation will only worsen. The corporation has a fleet of 1,900 buses and an annual mileage of 16.58 crore kilometres. It plies 2,400 services on 2,146 routes, of which 1,026 routes are uneconomical and even the operational cost is not being recovered. However, the diesel price hike is only a small part of the problem. The main reason for the mounting losses, despite substantial raise in government grant, is the indiscriminate privatisation carried out without any traffic survey. Politically influential private transporters have secured profitable routes and as a result occupancy of HRTC buses has come down from 72 per cent to 58 per cent over the past six years. The occupancy is declining even on long routes because of “irrational privatisation” with private operators managing most favourable timings, usually preceding the HRTC services. Yet overloaded buses with passengers on roofs is a common sight. It is not surprising that private buses are packed to capacity and the operators even offer concession to the commuters. The only way out is to provide a level-playing field by bundling uneconomical rural routes with profitable urban routes after conducting a traffic survey. The allotted routes must have an average occupancy of over 70 per cent. Further to ensure that buses ply regularly on rural routes, the task of monitoring should be assigned to the panchayats of villages from where the services originate. BJP spokesperson Ganesh Dut said the decision reflected the insensitive attitude of the Centre which did not spare even poorest sections which were already reeling under unprecedented food inflation. The increase would upset kitchen budgets of all sections of society and the diesel price hike would have a cascading effect on the prices of all the commodities. The Centre was not providing any help to the states ruled by non-Congress parties, and instead it was asking them to reduce taxes to further weaken them financially. The CPM said the Centre had struck another cruel blow to people who were suffering due to high inflation rate of 9 per cent. The Congress was serving the interests of corporates and was the least concerned about people. He said the UPA government had cheated the common man and the Congress was habitual in committing such acts. In a press note issued here, Dr Bindal said during the past three years the prices of petroleum products had been hiked unreasonably at least 10 times and the recent price hike would further add to inflation. Announcing this while presiding over a state-level function to mark International Day Against Drug Abuse and Illicit Trafficking here, Chief Minister Prem Kumar Dhumal called upon society to make prohibition a mass movement and save the youth from falling prey to drugs and other psychotropic intoxication substances. It was the social responsibility of every section of society to fight drug abuse and the state had already opened two drug de-addiction centres at Kullu and Dharamsala in addition to the two functional at the IGMC, Shimla, and Dr Rajendra Prasad Government Medical College, Tanda. He said special flying squads would be constituted and patrolling beefed up against anti-social elements involved in drug trafficking. Special prohibition awareness campaigns would also be launched in educational institutions to sensitise the youth about the harmful effects of drugs and tobacco use. A toll-free helpline would also be started to provide information relating to drug de-addiction. Hamirpur: School students organised a rally from Bachat Bhawan to the Gandhi Chowk here today to create mass awareness against the abuse of drugs. The rally was flagged off by Additional District Magistrate (ADM) Rajeshwar Goel, who also administered an oath to students against the use of drugs. Speaking on the occasion, the ADM told the students to keep away from the use of drugs as these were fatal. 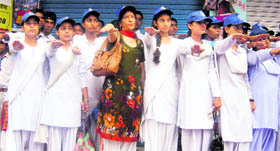 The District Information and Public Relations Department also organised a slogan-writing competition on the occasion in which Gulshan Kumar of Government Senior Secondary School, Bafdi, won the first prize, Yamini of DAV School, Hamirpur, won the second prize and Nitish of Government Middle School, Chowki, won the third prize. Bilaspur: All sections of society, including parents, panchayat representatives, mahila mandals and yuvak mandals, police, health department etc should collaborate their efforts to ensure that the menace of drug abuse and its illicit trade are not only contained and controlled, but sternly curbed. This call was given by Additional Superintendent of Police Bhagat Singh while addressing as chief guest a district-level seminar on International Day Against Drug Abuse organised by the District Nehru Yuva Kendra at the Youth Hostel at Jabbali, near here, today. Bhagat Singh said society should cooperate with the police and people should inform it about all those who were involved in this illicit trade. Dr ML Kaushal, Block Medical Officer, Markand, Pravin Sharma and Raj Kumar, Health Educators, also addressed it. District Youth Coordinator Som Dutt Zard urged all mahila mandals to take a lead in their areas and form a strong group to resist drug abuse, and ensure that all those who encouraged this evil and those who entrapped students and youth in it were exposed in society. KANGRA: The Kangra police today organised a function in a hall of the Superintendent of Police Office and a declamation contest of police officers was organised on the issue of drug menace a threat to the social setup. 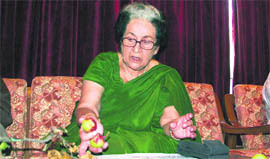 Laxmi Chambiyal, a senior citizen and social activist, was the chief guest on the occasion. She asked police personnel to do self-introspection and help in percolating the cultural ethos in the younger generation. Kangra District Additional Police Chief Sanjeev Gandhi, who presided over the function, suggested measures to curb the menace. Among the 10 participants in the declamation contest, ASI Surinder Kumar was adjudged first, SI Lokinder Singh Negi second and the only woman participant Constable Indu Bala was declared third. Stating this at a press conference here today, he said it should be made mandatory for the parties to make public the details like the amount received, the sources of donation and their assets and the information should be made available on the website. He said it was essential for cleansing public life and containing prices and unemployment, which were offshoots of corruption. He said fingers were raised regarding the donations received by Team Anna Hazare, which was agitating for enacting a strong Lok Pal law, but it uploaded the details on its website immediately. It was now the turn of political parties to come clean on the issue by making public the sources of their donation and the details of expenditure. Rampant corruption had severely eroded the credibility of the political parties. Agnivesh said the agitation for a strong Lok Pal Bill would be resumed on August 16 to build a country-wide movement against corruption. Team Anna Hazare had kept all parties at bay so that no one could gain mileage to achieve narrow political ends. The stir would be non-violent even if the government resorted to the use of force. He maintained that the problem of Naxalism and Maoism were also the result of corruption as people of backward tribal areas had been denied their share in development. Not only that, there was corruption even in “Operation Green Hunt” launched to contain Naxalism. Morever, when Maoists were ready for talks why was the government reluctant to settle the issue through negotiations, he asked. He criticised the latest hike in the prices of cooking gas and diesel, and said the upward revision had been effected at a time when the prices of petroleum products were declining in the international market. Omar Abdullah’s wife Payal, their two children and five others had boarded a raft at Pirdi near here and were to cover a 14-km stretch and alight at Zhiri. However, the guides of the raft failed to negotiate a spot following which the raft overturned. The guides and the rescue team immediately rescued all eight persons on board and shifted them to a nearby private hospital, where they were given first aid and discharged. Superintendent of Police Abhishek Dular confirmed that Omar’s family had met with a raft mishap and that all of them were safe. He said Omar’s family members had received minor bruises. Addressing a press conference here, she said the apple growers were suffering not only due to unrestricted import of fruit but also due to the devastation caused by hailstorms. She said under the accord, the government could not only raise the import duty but also impose a complete ban on the import of apple, provided it was established that an entire community was dependent on it for livelihood. She had written to Dhumal in this regard almost 18 months ago and urged him to carry out a comprehensive exercise to generate credible data to establish that the import of apple was harming the interests of growers and hurting their livelihood so that the ban could be imposed. However, the Chief Minister had not bothered even to acknowledge her letter. In the absence of credible data, the case could not be pursued with the Centre which had extended all possible support to the state for boosting the apple economy. Hailstorms had damaged apple crop in Shimla and parts of Kulu district to the extent of 80 per cent, but the government had not provided any relief. The impact of the last hailstorm was so severe that not only fruit but even branches had been damaged and as a result production would be affected for the next three to four years. She said small growers, who accounted for almost 90 per cent of the orchardists, had no money to buy insecticides as the government had not yet paid them for the fruit procured under the market intervention scheme. She demanded that the arrears be cleared forthwith and the recovery of loans be deferred by at least three years. Besides, hailstorm should be included in the weather-based crop insurance scheme and the Centre should pay 50 per cent of the premium, the state 40 per cent and the remaining 10 per cent be borne by the growers. Stokes urged the government to give 90 per cent subsidy to the growers on anti-hail nets. She said she was not against the anti-hail gun, but the technology should have been tested first. He said industrialists of the Goalthai area had met him and had submitted a memorandum to him. They had alleged that the BBMB barrier was a bane for the industrial area. They claimed that many big industrial units like Nestle initially wanted to set up their units in the Goalthai industrial area. However, they were “scared away” by Punjab policemen posted at the barrier. The minister said the security of the Bhakra Dam was under the jurisdiction of the Himachal police as the structure of the dam fell in Bilaspur district in the state. The Himachal police had set up a police station to check the vehicles going to the dam site. In view of the fact that the security of the dam was under the jurisdiction of the Himachal police, there was no need for the BBMB to erect its own barrier at the entrance to the state on the way to the Goalthai industrial area. Kapoor said the industrialists of the Goalthai area had alleged that Punjab policemen posted at the barrier were scaring away their suppliers. “I will write to the Chairman of the BBMB to get the Punjab police barrier at the entrance to the state shifted so that it does not cause harassment to the industry that has come up in the Goalthai industrial area,” he said. The Goalthai industrial area has been set up on the way to Bhakra Dam. It has provided a great economic boost to Bhakra oustees near the Punjab border. Though the industrial area falls in Bilaspur district, it is near Una district. The entrepreneurs who have set up their units in the industrial area are dependent on government offices in Una district for their daily official chores. The barrier has become a bottleneck for plying of commercial transport vehicles. Speaking at the concluding session of the two-day colloquium on “Fundamental Duties” organised by the Himachal Pradesh State Legal Services Authority and the SEWA Trust in association with the Public Relations Society of India here, he said it was the good deeds and hard work put in by citizens in the right direction which made a country proud and helped in its overall development. The duty was like a fundamental value and personalities were built on this foundation. He urged the students to learn from the experiences of their teachers and their own as well. Justice RB Mishra, Executive Chairman of the State Legal Service Authority, explained the essence of fundamental duty citing ancient scriptures which said “karma” was nothing but doing one's duty with honesty and dedication. Justice VK Ahuja said various courts had time and again underlined the importance of fundamental duties in day-to-day governance. Earlier, in his keynote address, VC, Himachal Pradesh University, ADN Bajpai said all the citizens must serve their mother land without selfishness. He said the research work must reach the fields from labs so that the farming community was benefited. He was addressing programme coordinators and subject specialists during the concluding ceremony of a two-day stale-level annual workshop of all 12 krishi vigyan kendras in the state here today. The Vice-Chancellor observed that sometimes good work went unreported due to the casual writing of reports and there was need for documenting it properly. He advised all kendras to develop model farms, establish mini-museums and give a “pragmatic touch” to all training programmes. He emphasised the need for specialised training programmes for farm women. Sharma said each kendra needed to develop its own website and an effective feedback mechanism to access the impact and the adoption rate of any technology. AK Narula, Zonal Project Director, Indian Council of Agricultural Research, while highlighting the achievements of the krishi vigyan kendras, said reports of each activity should be presented with correct data as these were required for funding agencies. Bajpai yesterday chaired the first meeting of the EC where a major decision was taken to bring about major reforms in the examination system. “A special committee will be constituted to study the examination system in the universities in the adjoining states which will recommend changes in the education system to make it more effective,” said Bajpai. He also informed the EC that in the future, no admissions would made at the graduate level after June 30 as per the High Court directives. The new session of the newly established Indian Institute of Hotel Management and Catering Technology (IIHMCT) will begin in its new building near here on July 18 this year. After the completion of the construction work of the institute’s new complex at Shashan, the state government has decided to run the new session from the institute’s building. The institute, which after its inception had been running its courses for the past one year at the Catering and Food Craft Institute, Kufri, near Shimla, will now shift its students from there to Hamirpur. CM PK Dhumal is likely to inaugurate the new building of the IIHMCT before July 18. The complex of the IIHMCT has been constructed by the HPTDC at a cost of about Rs 10 crore. Though the Chief Minister, at the time of laying the foundation stone of the institute, had said the work of construction should be completed within a year, the start of the session was delayed due to lack of water facility in the complex as about 30,000 litres of water was required daily and a new water scheme at a cost of about Rs 67 lakh was proposed for the institute. Now the state government has deposited this money with the IPH Department and work has commenced on the scheme. Meanwhile, water will be supplied through tankers. To accommodate students, 17 residences constructed for employees will be utilised till the construction of hostels. The institute is running degree and diploma courses in hotel management and food technology, and at present 125 seats are available. It has already been allotted 97 students on the basis of first counselling at the national level and the rest of the seats will also be filled up subsequently. Director of Tourism Dr Arun Sharma said, “The new session at the IIHMCT, Hamirpur, will begin from July 18 and we have made all preparations for this. Since the institute will run courses under self-finance schemes, many facilities will be provided after receiving fees from students”. 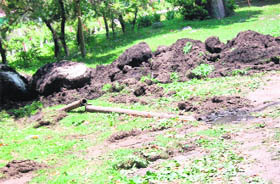 The guests are greeted at the entrance to the Circuit House by a foul smell emanating from a leaking sewer line inside the lawns. Except for the two main VVIP sets, there is no proper maintenance of the remaining rooms. “There is no housekeeping staff in the non-VIP rooms. The beddings have been stuffed up with rags to keep them in shape. Quilts have stains on them and stink and the carpets are no different,” complained guests who had come from New Delhi. The toilets are rarely cleaned with disinfectants and sanitary wares are broken, resulting in leakage. According to the rules, the PWD provides a toilet soap and a paper roll in each toilet. However, none of these are are being provided, the guests lamented. Though the PWD is responsible for the maintenance of the Circuit House, the booking is done by the office of the Assistant Commissioner, Kullu, according to PWD officials. Though the government has opened them for private guests on a charge of Rs 250, the bookings are allegedly done at the whims and fancies of officials in the name of ministers and VVIPs from the state. “There are cases of impersonation as walk-in guests are adjusted in the name of ministers or VVIPs,” said sources. The PWD has to pay an annual electricity bill of around Rs 3 lakh. PWD Executive Engineer Ashok Chauhan said they had started the repair work to plug the leakages in the Circuit House. “We don’t get enough funds for maintenance and bookings are done by the Deputy Commissioner’s office and we charge just Rs 80 as room rent,” he added. Assitant Commissioner RK Thakur denied the allegations regarding any fraud in the bookings. The Deputy Commissioner, however, said action would be taken in case any fraud was established. He presented a rare case, “Laparoscopic repair of larrey morgagni hernia and para esophageal hernia in the same patient”, the world’s second such reported case. His presentation was highly acclaimed at the congress. Dr Bindal also got training in robotic surgery at the International School of Robotic Surgery, Grosseto, Italy. Robotic surgery is the most advanced from of minimally invasive surgery available in the world. The authors of this paper included Dr Parveen Bhatia and Dr Sudhir Kalhan.